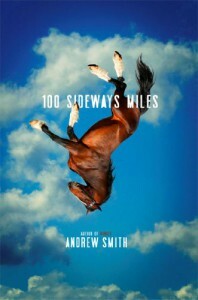 OVERALL IMPRESSION: I've wanted to read an Andrew Smith book for quite a while. Everyone seems to rave about his books and I was curious to see what all the fuss was about. I was pretty disappointed with this one. About a third of the way through the book, I started to loose interest. Not much was going on and I was quite bored. I was prepared to give this book a 2.5 star rating, but in the last fourth or so of the book there was an event that happened that brought quite a bit of excitement to the story and I decided to bump it up to 3 stars. CHARACTERS: The characters were okay, but not my favorite. I did enjoy reading about Finn's epileptic episodes, but other than that I didn't really feel myself connecting with anybody. COVER: I like the cover a lot after learning what the significance of the horse means.